The NSW Department of Transport and Sutherland Shire Council are working together to develop separated cycling and walking infrastructure that connects people to schools, shops and services. 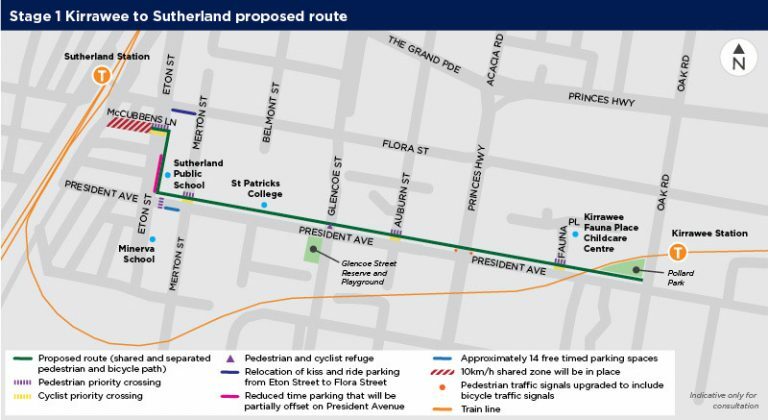 Ray Rice and Bastien Wallace of Bicycle NSW were invited to meet with transport planners to review designs for the initial stage from Sutherland to Kirrawee. A lot of thought has gone into selecting the safest, most convenient route. All but one intersection provides bike riders with a priority crossing. Some areas provide shared paths to accommodate developments along the route and the need for waiting areas for school bus collections. In an area where around 50 per cent of trips of less than two kilometres are made by car, this separated infrastructure with landscaping promises a pleasant ride. It also fits into larger plan to increase active transport in Sutherland. “We like the plans, and think they support local active transport, especially riding to school,” said Ray Rice, Advocacy Manager. As each of the phases are delivered people in Sutherland will be able to travel more easily by bike and foot for local journeys.